We have the experience and flexibility to manage your project from start to finish, so you can rest easy. This is The Co-Pak Way. Co-Pak offers a range of transportation options to ensure the timely arrival of your project’s shipment. Our custom kitting services include packaging and labeling your products and preparing them for retail. We leverage a number of logistical tracking solutions to ensure your product arrives where and when it should, in the right condition. With our fulfillment services, we’ll make sure that your shipments arrive on time, every time. After your design plans are finalized, we will deliver your displays on time, on location and on budget. Our team will work directly with you to come up with a co-packaging solution that supports your brand’s goals and makes your products stand out in-store. Co-Packing, Supply Chain & Display Solutions! Combining Insights And Experience With A Culture Of Service Excellence. Since 1999, Co-Pak Packaging Corp. has acted as a highly committed partner to leading national and multi-national brands across a number of industries. Our Co-Packing and display solutions are in almost every coffee shop, grocery store, drug store, convenience store, gas bar or retail store across Canada and much of the U.S. Most importantly, they are all winning with shoppers! When it comes to packaging solutions, we really do it all. From contract packaging and blister packaging to box packaging, custom packaging solutions, and more, you can rest assured that you’re in good hands when you turn to us. Exceptional packaging solutions aren’t the only things that we provide. 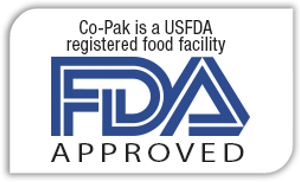 At Co-Pak, we’re also known for our fulfillment services. After we’re done creating the best packaging possible for your brand, we’ll work within your system to design a successful supply chain management campaign. From start to finish, we’ll make sure all of your questions are answered and that your shipments arrive on time, every time. In addition to fulfillment services, we can also turn you over to our partners at d3 for display design and creation. As a member of the Co-Pak family, d3 is here for you to make your brand stand out in stores with custom store displays, permanent displays, semi-permanent displays, temporary displays, display-ready pallets, and much more. Co-Pak’s strengths are our people and a shared commitment to delivering on expectations. We take our role in the development of your brand seriously and won’t stop at anything to make sure your products come out on top. We take full responsibility and ownership of all tasks. In a certain sense, every task is custom, unique, and requires a different problem-solving strategy. Don’t worry; we’ll handle this for you and will do everything in our power to take the stress out of the packaging process. We do this by using our signature collaborative, results-driven process. We have the flexibility to deliver on objectives as your business needs to evolve, and we’re always the first to roll up our sleeves to complete our jobs on spec, on time and on budget. This ensures our partners receive the help they deserve and their brands receive the type of merchandising solution that drives sales growth through best-in-class in-store shopper connections. Insights, quality, integrity and teamwork … The Co-Pak Way. Co-Pak offers packaging solutions to, the following areas: Canada. Greater Toronto Area (GTA), Greater Montreal Area (GMA), Greater Vancouver Area (GVA), Calgary, Halifax. USA. Chicago, New York, New Jersey, Los Angles, Dallas, Seattle, Atlanta, Charlotte, Kansas, Miami. Europe. London, Paris, Barcelona, Frankfurt, Milan, Prague, Budapest. ASIA. Mumbai, India, Bangkok, Thailand, Manila, Philippines, Hangzhou, Beijing, China, Colombo, Sri Lanka. Brazil. Sao Paolo.